A water-resistant calendared white PVC vinyl with a permanent pressure sensitive adhesive and a non-glare finish. A water-resistant calendared white PVC 10oz vinyl with a permanent pressure sensitive adhesive and a high sheen finish. A water-resistant calendared white PVC vinyl with a removable pressure sensitive adhesive and a non-glare finish. 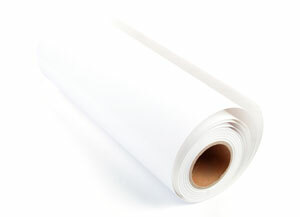 A water-resistant calendared white PVC vinyl with a removable pressure sensitive adhesive and a high-sheen finish. A water-resistant high density specially formulated polyethylene film with outstanding puncture and tear resistance and a non-glare finish. A water-resistant, durable and economical polypropylene film with a non-glare finish. A water-resistant white bi-axially oriented PP 4 oz. film (BOPP) with a permanent pressure sensitive adhesive and a non-glare finish. A water-resistant white biaxially oriented PP film (BOPP) with a removable pressure sensitive adhesive and a non-glare finish.